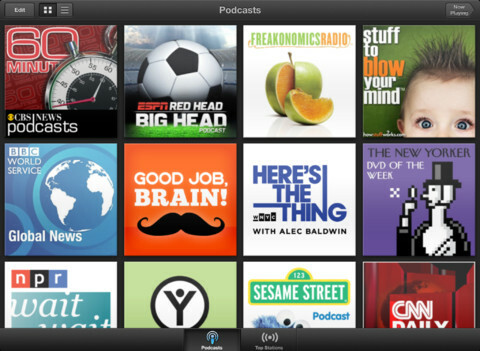 The new Podcasts app for iPhone, iPod touch, and iPad from Apple. The new standalone Podcasts app is the latest in the series of new apps that have been breaking away from the original iPod and iTunes apps like iTunes U, Videos, and the Music apps. 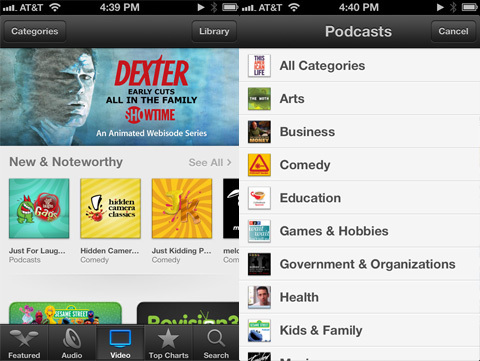 Starting with the iOS 6 software update, you will no longer find Podcasts listed in the iTunes app. The Podcasts app will be the one place to find, browse, subscribe and listen or watch audio and video podcasts on your iOS device. Both iPhone and iPad users will be able to use the newly release app which contains a built in podcast catalog for discovering new podcasts. 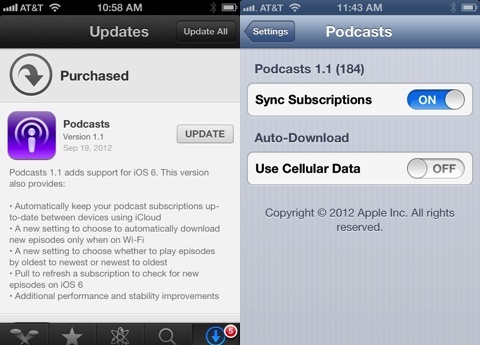 iCloud syncing of your subscribed podcasts is supported in the latest update to the Podcasts app. 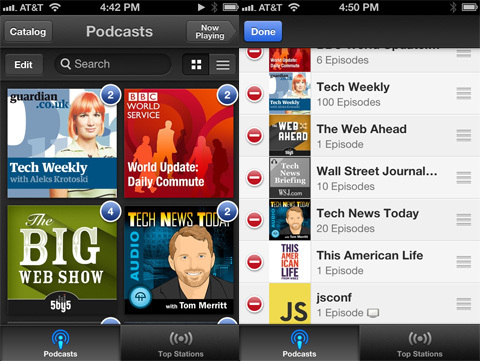 Podcasts uses a very similar layout to the new App Store design in iOS 6. Details and description of the podcast, reviews and related podcasts are small tabs. Tap the small “i” icon to read the full text description of the episode including file size, duration and date. There is a Subscribe button, or you can also tap to download individual episodes to your device. Funny enough, to see the list of the podcasts you are downloading you still have to go to the iTunes app, and look under the More/Downloads section. Finding the podcasts you like is easy with the keyword search feature, although Apple has done a great job of providing other discovery routes in the app like Featured, Top Chards, as well as a separate section for Video vs. Audio podcasts. You can filter podcasts by topic using the Categories button, or browse through the slideshows and special promotions in the app to find something interesting. While in the Library view, you will also find a new intuitive radio dial interface under the Top Stations tab that is a fun way to check out a set of promoted stations by genre. You can view all your subscribed or downloaded podcasts in one place and you can change the view from large thumbnails to a list view. Video podcasts are shown with a small screen icon in list view. 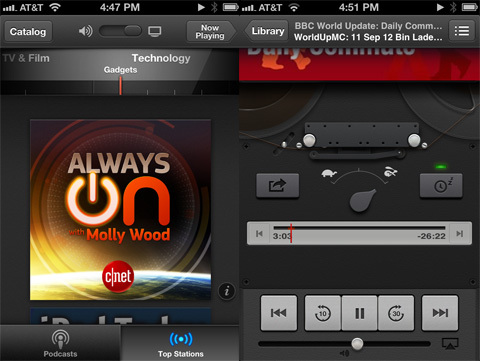 When in large view, you can tap and hold to drag your podcasts around and rearrange them. You can also slide up and tap the Edit button, which lets you either drag your podcasts to organize their order or delete them from your device. From here you can also search for a podcast episode in your library by keyword, which is nice if you’re looking for something specific by name. The playing screen has basic volume/pause/play/end/beginning controls, as well as a 30 second forward skip and a 10 second rewind button. Tap the podcast banner to slide it up and reveal the cool tape reel interface underneath. Here you’ll also find the seek bar, timer, buttons for speeding up or slowing down live playback, as well as a sleep timer button. Sleep timer is great for listening for anywhere from 10 minutes to 1 hour before stopping playback in the app, perfect for listening to podcasts in bed or on a plane. You can output your video/audio to Apple TV, Airport Express or any other AirPlay supported device. When you find a podcast you can tap to turn on a subscription to it on your iPhone or iPad. 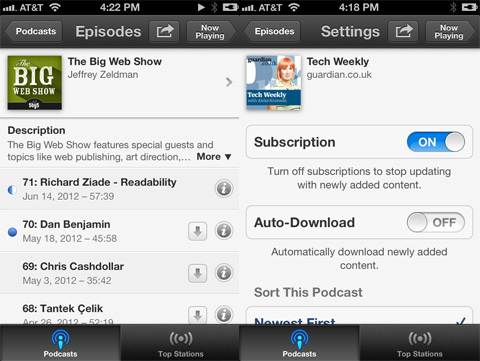 Additionally you can tap to turn on an Auto-Download option per podcast. This will tell the Podcasts app to automatically update and download newly added content when you open it. You can choose to keep all episodes, most recent episodes, or anywhere from the last 2 to 10 files on your device for offline consumption. 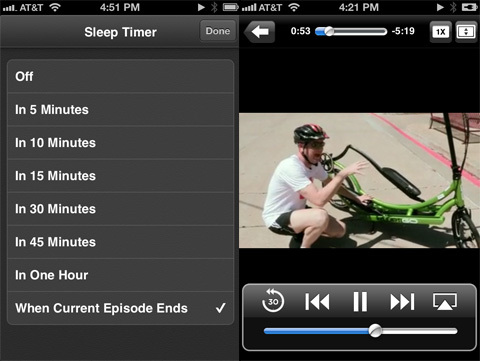 You can also reverse the sort order of the episodes if you wish. Finally you can mark all episodes as played or unplayed. Currently these settings are per podcast, so there is no way to modify them for all your subscriptions. The latest version of Podcasts app version 1.1 for iPhone and iPad, along with iTunes 10.7 have implement iCloud synching. This is wonderful since you now get automatic sync between your iOS and iTunes if you’re using the same iCloud account. If you have iTunes on your desktop and you subscribe to podcasts there, and you sync your iOS device with your computer, you get certain things synced up, while not others. First of all, subscriptions: Podcasts you find and subscribe to via the app are not synced with your desktop iTunes, or across iOS devices. It seems that the only way your subscriptions sync is from the PC to the iOS but not the other way around. But even when you subscribe to something on your PC and it shows up on your iOS, the “subscribed” button is not automatically enabled on your iOS device. So you’re basically just getting the audio/video files moved over, not a subscription tied to your iTunes account over the cloud. Second, Listening location syncing: If you’ve started listening to a podcast on your iPhone and you sync with your PC, the place you left off on your iOS device is synced to the PC. But not other way around. So if you listen to a podcast on your PC, and sync with your iPhone, your listening location is not updated on your mobile device. If you have an Apple TV you will notice that you can also find and subscribe to podcasts there. But unfortunately since your podcast subscriptions are not stored in your iTunes account and therefore do not automatically transfer there either, so you’ll have to find the same podcasts again and re-subscribe there. Third, Playback history: At this time the playback and unplayed counts are not reflected nor updated at all during a sync operation between iOS and iTunes. Overall, the Podcasts app is a great start, especially when it comes to the user interface and the playback functionality. Since Apple has added support for syncing podcast subscriptions and playback history wirelessly via iCloud, we’ve upgraded the rating of this app. It is now a much more enjoyable and usable experience for consuming audio and video podcast content. AppSafari review of Podcasts was written by Joe Seifi on September 12th, 2012 and categorized under App Store, Featured, Free, iPad apps, Music, Podcasts, Universal, Video. Page viewed 6789 times, 2 so far today. Need help on using these apps? Please read the Help Page.